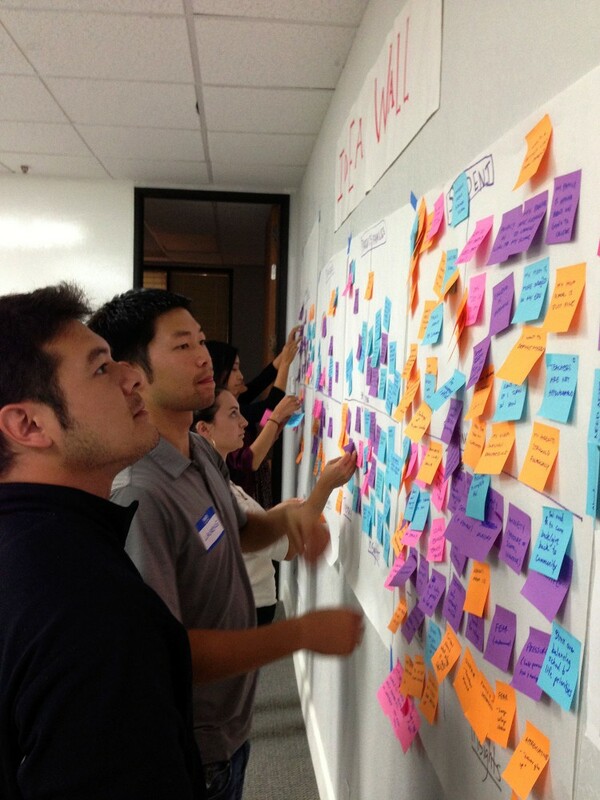 I was reflecting for a moment on the picture here, where Design Thinking was in action, and was thinking about how we often ask students, teachers, parents, administrators, workers, and so on to add their ideas to a wall through a brainstorm method. But I was also thinking about accountability. I wonder if it would be better to create a system like this where everyone needs to have their name attached to their idea. My theory is that it would help in two ways. The first is that the overall architect(s) would be able to return to the brainstorm and see who’s name is attached to the idea. This way, if there is a problem, they can quickly follow-up with that person to get a clearer idea of what they were writing about. The second idea stems from the fact that I assume people will put more effort into an idea if they know their name is attached to it. With anonymity could come sloppiness, laziness, or downright silliness. Where I think it might squash some of the better ideas because people may not want to put them forth since their name is attached, to counteract this, people could be asked to come back to the wall or another wall for another turn at it. This time, they could put any idea that came to their head, but could do it anonymously. I would argue that using both methods would be most useful because most ideas would be well thought out and articulated from those who had their names attached, but the second method would enable out-of-the-box thinking and the bizarre ideas to flourish. What do you think? Has this approach been done before? Lately, I have been working with elementary students through our Digital Citizenship curriculum. Of course, part of this curriculum is about online safety, bullying, and other worries through social media. In continuing my research around COPPA and CIPA laws I have started to wonder about the 13 year old age limit that has been determined to be the cut off for those who are and are not able to use social media sites like Instagram, Facebook, and the like. For example, Facebook states that no user may have an account or have an account made for them by an adult if they are under 13 years of age, as shown here. Instagram also clearly states in their first term that users must be 13 years of age. But there is no graduation to this level. There is no scaffolding or built-in support and I wonder why. For example, in Canada and other countries there is graduated licensing to drive a car. This means that a user, or the driver in this case, needs to learn along an experienced user who will guide them through the pitfalls of their learning journey. I would argue that learning on social networks also needs this hand-holding. But I would also argue that starting to teach a child at the age of 13 is too late AND that having a child care for their account would necessitate ownership by the child of the account. Therefore, I propose that a system needs to be built, with COPPA and CIPA adjusting their regulations in such a way that kids can sign up with a parent or guardian, that the adults receive updates about account activity, and that this feature eventually fades out over time. Possibly at the beginning of account activation there has to be a two-party login, where both parent and child have their own password. It sounds complicated, and probably is, but it seems short-sighted that the age 13 is a magic, non-arbitrary number that ensures that a child is safe and has healthy online habits that are ready for social situations.